I know that I've written about something similar to this in the past, and this story actually came out on Monday, but it was too disgusting to pass up. So, a New York woman may be too "chicken" to eat at Popeyes ever again after finding what she claims is a rat head in her meal. Um, claims? That is a rat head! Rosemary Thomas, of Clifton Park, NY, on Sunday posted an unappetizing photo of her meal on Facebook and said it came from Popeyes in Harlem, where she was eating with her family. She wrote on her Facebook post, "This is clearly a rat and they have the nerve to have a 5 rating by the Department of Health?" According to Thomas' Facebook post, she took her daughter to an urgent care clinic because the experience made the girl sick to her stomach. She wrote, "Yesterday, she ate nothing all day. All she said she could think of was that rat head after she consumed the crispy part." She also continued that she still had the rat head. Why? Why would you want to keep that? Evidence? The photo was evidence enough. I hope all of you finished eating your breakfast. A spokesperson for Popeyes said the company is aware of the woman's experience and that the owner of the franchise has reached out to Thomas to get to the bottom of the incident. The spokesperson said, "He's meeting with Thomas as soon as she is able. In the meantime, he ordered a health department inspection and they found nothing out of the ordinary. We checked with suppliers and they feel it is most likely chicken organ meat. We will work with the guest to recover the product and test it to confirm that." 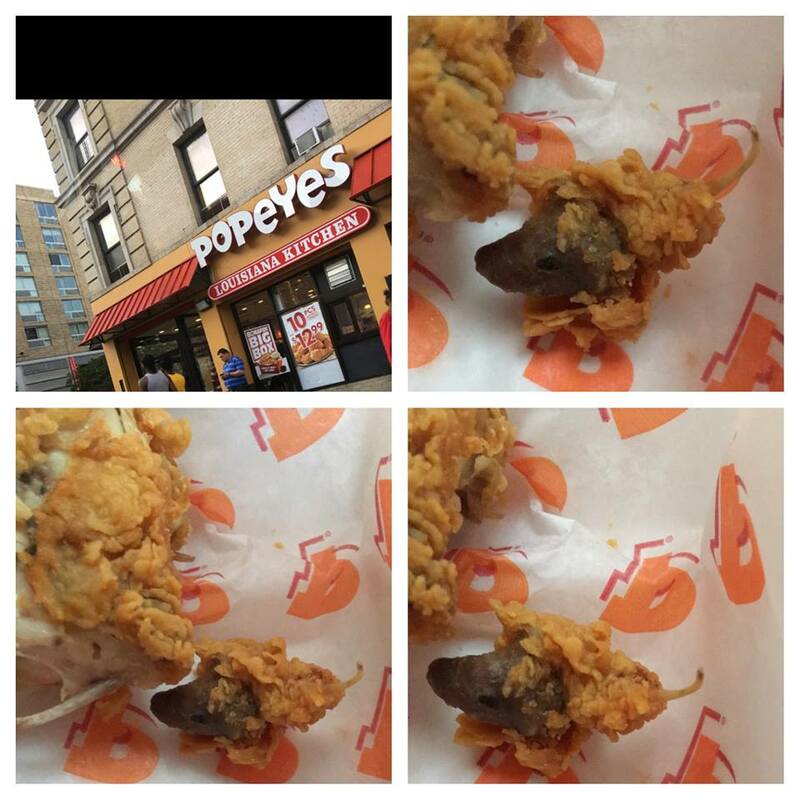 This isn't the first time Popeyes has been accused of serving deep-fried breaded rat to customers. Back in July, a woman in Louisiana, reported seeing a rat inside a chicken breast and posted it on Facebook. I mean, hey, you can't help what falls into the deep-fryer once you get that thing going. It could be a mouse or a rat or a hand. Either way it's disgusting! Although, I like Popeyes better than KFC, it might be time to just fine my own recipe for fried chicken. This way I know it will be chicken....or cat, at least! Just kidding about the cat.